Mohlopheni Jackson Marakalala is an Associate Professor in the Division of Infection and Immunity at University College London. He heads a research group at Africa Health Research Institute, and holds an Honorary Research Associate affiliation with the University of Cape Town. 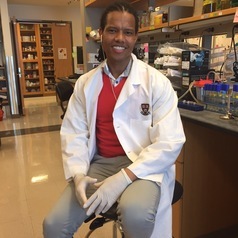 He is also a Visiting Scientist at Harvard School of Public Health, where he recently completed a 4 year postdoctoral fellowship in infectious diseases. He is one of the current Next Einstein Fellows, and was recently honored by World Economic Forum as a Young Scientist. Mohlopheni hopes to discover new therapeutic and diagnostic tools to combat infectious diseases mostly prevalent in Sub-Saharan Africa. His laboratory research focuses on the development of better therapies against Tuberculosis. He hopes to contribute towards public dialogues that will help inform better health policies. He also envisions building research capacity in Africa by training PhD students from disadvantaged communities.